Minute Maid Juice Bottles (6 Pack). Now the same products and packages that you see in convenience stores around Atlanta, are available for delivery to your office or workplace. Minute Maid Orange Juice is made of 100% Orange Juice. Minute Maid Apple Juice is 100% Apple Juice and Minute Maid Mixed Berry is 100% Juice. We now also have a Fruit Punch available. 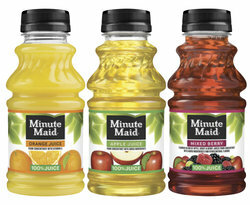 Minute Maid Juice in 10 oz Bottles (6 Pack). Choose your Minute Maid Juice Products below.